CCSAP recognized for donating Pill Dragon to the Onslow County Sheriff’s Dept. Military personnel were given information on responsible drinking limits and amounts of alcohol in different types of drinks at an Alcohol Awareness and Safety event. Brochures about prescription drug misuse and abuse, how to prevent it, or help someone who is using are being distributed throughout the county. Onslow Task Force is decorating a tree with a substance abuse theme for this year’s Festival of Trees. Businesses, organizations, and individuals can donate for decorations on the trees. Alcohol Retail Purchase Surveys were performed throughout the county to verify that stores and shops are properly carding youth for alcohol purchases. CDC reports that enhanced enforcement of ID laws is an effective strategy to reduce underage drinking. 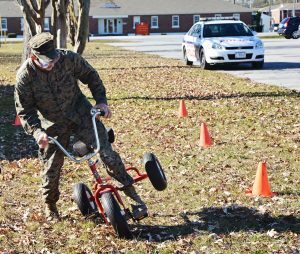 Military bases in Onslow have begun on-the-job alcohol screenings and required alcohol counseling if tests are positive. Onslow County Schools has given approval for CCSAP to qualify as an organization for which Onslow County’s “SAT Scholars” can receive volunteer hour credits. Onslow County Sheriff’s Department, with Jacksonville Police Department and Swansboro Police Department, participated in the annual Operation Medicine Drop to dispose of prescription medications properly. Unwanted and unused medicines were collected at Walgreens locations. A prescription drug drop box has been installed at Onslow County Sheriff’s Department and Jacksonville Police Department to dispose of unused, expired and unwanted prescription medicines. CCSAP also purchased a Pill Dragon for the Sheriff’s office to use. The Pill Dragon is an incinerator that destroys drugs.